With one hand and a quick deft motion, a magician ties a knot in a rope. Rope magic is a standby for many magic acts and the Instant Knot is a great way to spice up any rope act. As a bonus, the effect can be performed with a necktie for a great "pub bet"
The magician proposes a bet - that with one hand and in less than three seconds, he can tie a knot in a tie. After the cheers and jeers die down and the bet is accepted, the magician removes his tie and runs it along his right hand. At the word "go!" he whips his hand back and forth and dangling from his fingers is a tied tie, complete with loop! 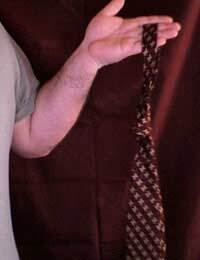 When performing the tie version of the Instant Knot it is important to give the right hand a little "help" but slightly tossing one end of the tie with the left hand at the word "go." With both versions the secret lies in knowing how to grab the rope or tie. Magician's rope for the classic version and any tie for the tie version. Plenty of practice as with any trick, but other wise this is ready to go at a moment's notice once you know how it is done. A borrowed tie works great, too! Lay a length of rope (no more than a couple of feet and no shorter) across your right hand. Your hand should be thumb side up, palm naturally facing inwards. The rope should lie across the top of your thumb where it joins your hand. The trailing end of the rope (the side across the back of your hand) should be about four inches or so longer than the side closest to you. Turn your hand inward, fingers towards your torso, and reach down. You may need to raise your elbow a bit to get the right angle. Your right index and middle fingers should grab the longer end of the rope about a third of the way down from your hand. Push your hand forward a bit and let the rope that lays across the back of your hand fall down. Turn your hand back to its starting position. You may need to flick your fingers up a bit to pull the rope held with your fingers up enough to clear the closing loop. Snap your hand down like you are cracking a whip - that will tighten the knot. Bingo - Instant Knot. Holding the fat end of the tie with your left hand, run it across the back of your right hand, which should be in the starting position for the Classic version. Stop when the fat end starts to narrow - as above you want the trailing end longer. You are going to perform a similar motion to the Classic version, except the tie is not going to fall over your hand without some help, and you want to create a loop. At the word "go" (remember you are still holding the fat end with your left hand - almost like you are a tie salesman showing off the quality of your tie) start your motion with the right hand (fingers in and down, grabbing the trailing end with first two fingers) but first flick the fat end away from you - this helps you clear that part of the tie and get to the trailing bit. Don’t wait for the tie to fall off your hand, just quickly whip the tie as above. Because of the material of the tie and your speed, you wont pull the trailing end completely through, but rather a knot will form in the middle, leaving you holding the loop. The tie should look like you were wearing it, loosened the knot, and slipped it off your neck. In the classic version if you don't move quick enough, or smoothly enough, you will end up with a loop, so be careful. Sometimes it helps when you start the move to grab the shorter end near your hand with your little finger just before you reach for the trailing end with your first two fingers.